Baby led Weaning, let the adventure begin. 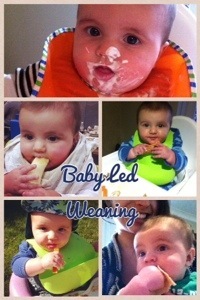 Call me weird but I love weaning. I know it’s super messy and requires a bit of time and energy but it’s so much fun! I love watching babies eat things for the first time, watching them learn and get better at feeding themselves, seeing their joy in it all and laughing a the mess they get themselves into. For me it’s a time of hilarity and inventiveness. My baby boy has recently turned 6 months and started on solids. Being 6 months he can pretty much eat anything so I’ve started him straight on our family meals. His first few forays were steamed vegetables and fruit but after a few days he moved onto trying whatever we were eating. I’ve always cooked with no salt since we had our first baby so most meals are already suitable. These are usually the same as it’s a rush in the mornings in our house. Readybrek with some fruit mashed in (banana, blueberries or stewed apple from my freezer stash). Baby J feeds himself if I load up the spoon and give it to him. Sweet potato wedges steamed with roasted peppers and courgettes (we had a sweet potato chilli). Leek and mushroom risotto – he loves this. Pasta in a tomato sauce with vegetables (I keep some vegetables in larger chunks for him). Previous PostReview: Koji Drinks, put some fizz in your life.Next PostCreamy Salmon Pasta for non fish lovers!